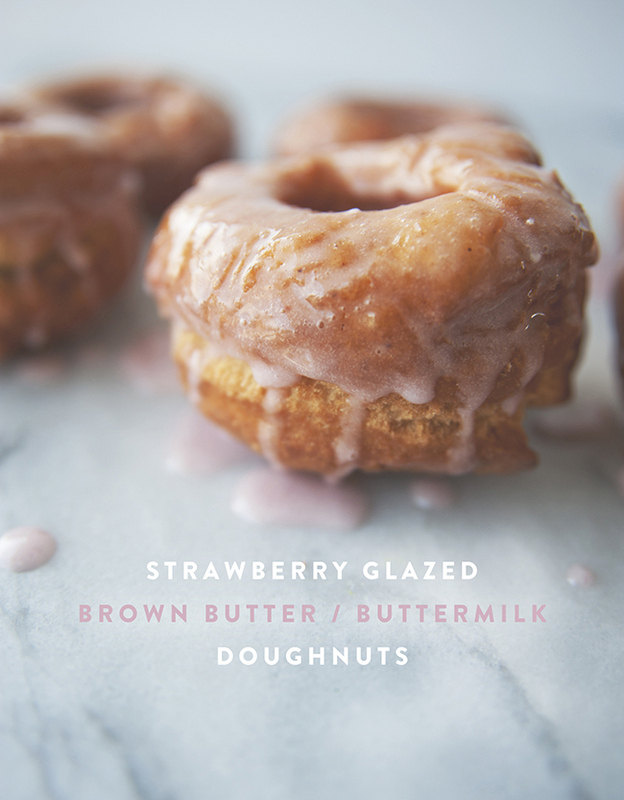 These are all about simplicity: barely pink strawberry glaze on top of fluffy, cakey buttermilk donuts. Feel free to switch out strawberries for any other berry, or even cherries. These are so delicious. Whisk together the dry ingredients in a bowl; set aside. Combine sugars, butter, and wet ingredients in the bowl of a stand mixer fitted with a paddle attachment; mix until smooth. While mixing, slowly add dry ingredients and mix until a soft dough forms. Heat 2″ oil in a 6 quart saucepan until a deep-fry thermometer reads 370°. Spread a little flour on your counter, and roll out the dough to a little under an inch thick. 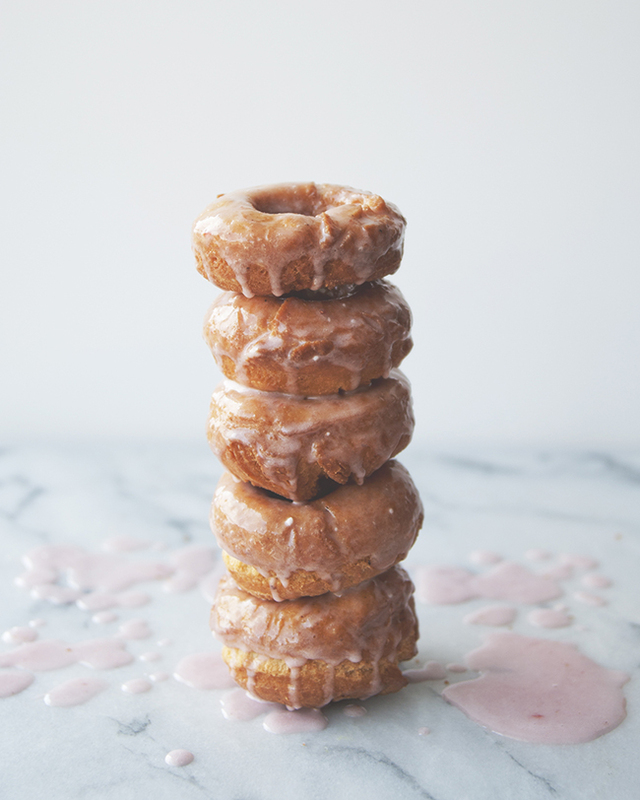 Use a floured donut cutter to cut out donuts. Carefully slide the donuts (and donut holes) into oil and fry, flipping once, until puffed and golden, about 3 minutes for the whole donuts, about 2 minutes for the donut holes. 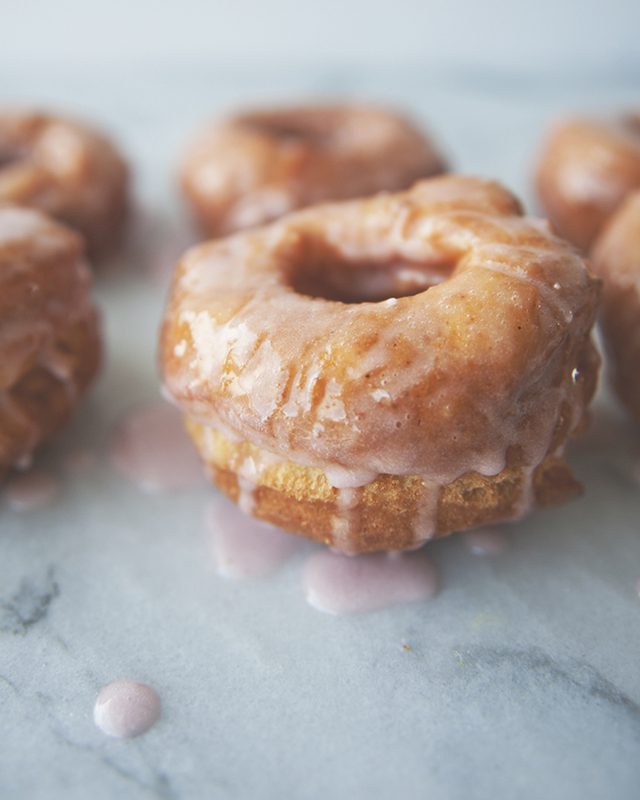 Using a slotted spoon, transfer to a baking sheet with a wire rack; repeat with remaining dough and let donuts cool completely. Combine the strawberries, lemon juice, and white sugar in a small pot over medium heat. Cook for about 5 minutes, or until the strawberries have released most of their juices and have cooked down into a light syrup. Turn off the heat and smash the strawberries with a fork. Strain if you like (I did). While the liquid is still hot, add the rosewater, powdered sugar and butter, and stir until combined. If too thick, add a tablespoon of milk. 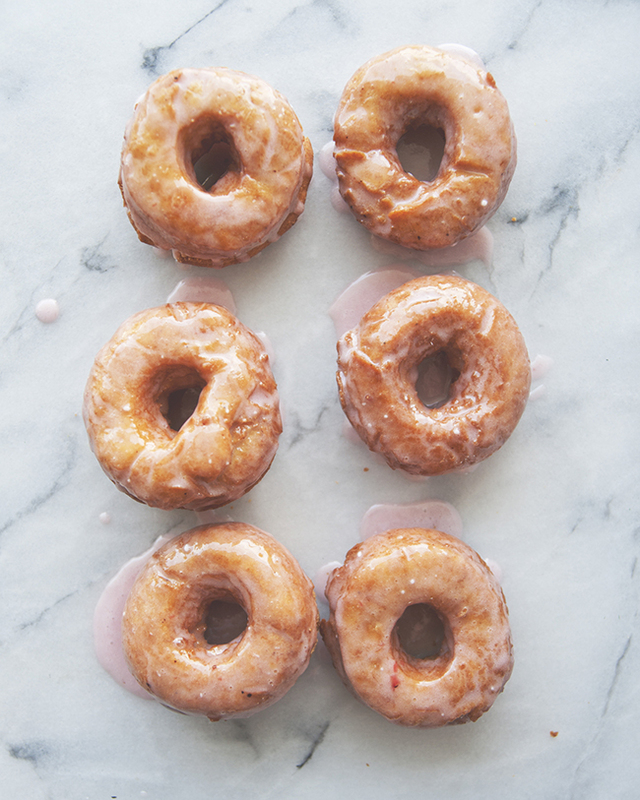 Dip the donuts in the glaze and let them cool on a cooling rack. If the glaze hardens in the pot, just heat up again and stir.